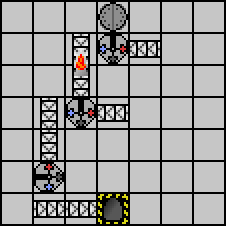 This entry was posted in games, links, logic, programming, puzzles and tagged game, robot, test. Bookmark the permalink. Yeah that game is awesome. In a few weeks I’ve got an exam about computation so this is perfect procrastination. Anyway, thanks for the fun, and this is a very cool blog. A flat line of b/r gates, solves that. I just started “put a yellow dot in the middle of a string”… Tough stuff. haha, didn’t realise guys can enter gates from the sides! Rocket: I guess that happens to work on the test cases the game uses, but wouldn’t it fail on something like BBBRBRRR? (That is, it would accept that string when in fact it should not?) It also doesn’t work for the reason Tom says. Looping it wouldn’t work since if your loop is n units long then you can’t tell the difference between any two numbers that have the same remainder when divided by n.
I wonder if you could solve it by re-writing the whole code, but leaving off the first blue and the first red you meet, and then running that process again, so the code loses a blue and a red each cycle…that way the whole code would continually reduce itself so that (if it’s legitimate) there’ll be just one blue and one red at the end…and you might somehow be able to tell that it has been reduced as such. Tom: that’s exactly how I solved it! Tom: hehe, nice, you have just discovered the “bit shift” operation. =) Almost all modern CPUs can do this as a special case so that multiplying by powers of two is much faster than multiplication in general. This is a really interesting game. I’ve never done any programming, and I haven’t taken any computer science courses yet, but I find this game very enjoyable. Thanks for the link! Nice game! I just have a few levels left. The only concern I have about it is that they should have put more thought into their test cases (or problem descriptions). Cause there are very simple test cases that break some of my accepted machines. Yes, I agree with you re: test cases! That would be equivalent to solving the halting problem – I guess that it uses some scripted heuristics, such as to check if loops are used, probes the complexity behaviour or simply tries strings which are too long to accommodate with a feed-forward network. You can also download the Manufactoria.swf and play with the standalone flashplayer. > I just have a few levels left. Our robotic investigators bring you today the news of tomorrow – and for all other days, too. ROX News, the Robotic Objective eXaminer. fair & balanced [tm] and 100% cognitive consonant. @Ignatius: Nah, the Malevolence Engine doesn’t do anything so complicated. It just does total-coverage testing for all tapes up to 6-12 dots long (the amount of total-coverage depends on the expected running-time of the machine – early ones do all tapes up to 12 dots, the last ones only go up to 6). It then tests several randomly-generated longer tapes. I think that Robochildren also specifically tests a maximum-length tape filled with half one color then half the other, to break naive machines just using chained branches. Also, as part of the XKCD message board’s obsession with the game, I wrote a Manufactoria emulator in js at http://www.xanthir.com/manufactoria. Check it out – it’s good for testing out the really slow machines at the end, because it can execute long strings enormously faster than the flash version does with its animations.